Tax revenues provide governments with funds to invest in development, relieve poverty, deliver public services and build the physical and social infrastructure for long-term growth. Moreover, there are mutually beneficial links between taxation and good governance. Tax and Development: Aid Modalities for Strengthening Tax Systems highlights how taxation can have a positive effect on the quality of governance and a government’s relationship with citizens and, in turn, how good governance can have a positive effect on compliance and revenue mobilisation. How can international assistance providers, including OECD members, international and regional organisations, support the development of tax systems in developing countries? Tax and Development: Aid Modalities for Strengthening Tax Systems provides practical guidance for policy makers and practitioners based on the results of an extensive literature review, a survey of aid agency officials and six country case studies (Ghana, Guatemala, Liberia, Mali, Mozambique, and Tanzania). It examines the aid instruments that donors use to assist developing countries including general and sector budget support, basket financing, stand-alone bilateral aid and funding South-South organisations. 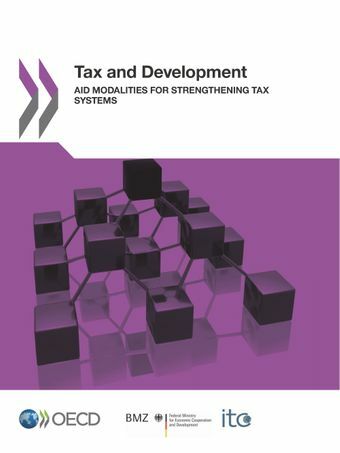 The strengths and weaknesses of each modality for supporting tax systems are identified, and some 50 recommendations to support the development of effective, efficient and growth-oriented tax systems in developing countries are provided.